Ship Cards -54 Red cards with Blue Logo "Heritage"
Playing Cards - 108 Blue cards with Red Logo "Heritage"
Special cards: 4 minefield, 8 additional ship, 2 submarine, 2 torpedo boat, 4 1point Additional Damage, 2 2point Additional damage. The battleships, aircraft carriers, and battlecruisers of WWII roam the seas again! 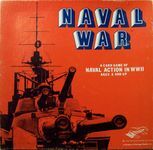 In this unique card game, three to six players command a "fleet" of the world's most feared ships. Drawn from a deck of 54 cards, you might get the Bismarck, Gneisenau, Prince of Wales, Hood, Ark Royal, Roma, New Jersey, Enterprise, Shokaku, or even the gigantic Yamato, largest battleship ever used in battle! Using another 108 card deck, you can attack the enemy with salvos from your guns, make carrier strikes, destroyer torpedo attacks, raids, by submarines or torpedo boats, or set up minefields. To stay out of Davy Jones' Locker, you might want to use a smoke screen. Meanwhile, remember to get your minesweepers working, and should you need it, repair facilities are available. The game includes 162 cards, rules, score pad, all in a handsome box.